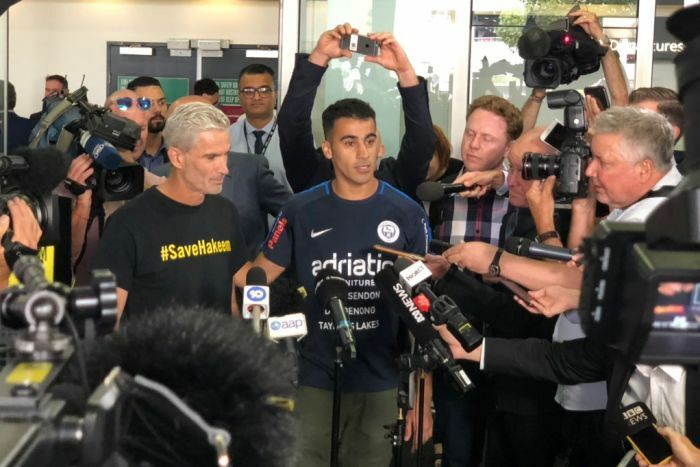 Refugee footballer Hakeem al-Araibi arrived Australia on Tuesday, 77 days after he was arrested by Thailand authorities on an Interpol red alert, drawing global condemnation and a campaign to see him freed. The Bahrain-born was detained on November 27 while on honeymoon at the request of Bahraini authorities who accuse him of offences linked to the 2011 Arab Spring uprisings. His detention sparked worldwide outcry and a protracted diplomatic dispute between Bahrain, Thailand and Australia that raised questions about the neutrality of Interpol and the writ of Canberra’s refugee protections. Prime Minister Scott Morrison led the celebration of Araibi’s release, saying many Australians’ prayers had been answered. Morrison thanked the Thai authorities, who had earlier left his written appeals for Araibi’s return unanswered but abruptly dropped extradition proceedings on Monday at Bahrain’s request. “We have been informed that Bahrain wants to withdraw the (extradition) request… if they don’t want him, we have no reason to keep him here,” Chatchom Akapin, a director-general in the Thai prosecutor’s office, : AFP. “Two moments captured the world’s attention this month: the photo of footballer Hakeem al-Araibi shackled and barefoot, and the moment of Hakeem breaking the chains and reunited with his beloved wife, friends and the football community inÂ Melbourne. Kasit Piromya, a board member of the lobby group ASEAN Parliamentarians for Human Rights, said the case showed the failings of Thailand’s “outdated” laws and policies. Thailand’s treatment of refugees has been thrust under international scrutiny in recent weeks. In January, an 18-year-old Saudi woman who ran away from her family arrived in Bangkok’s airport and armed with a smartphone and a captive Twitter audience managed to outmanoeuvre Thai authorities and gain refuge in Canada following her pleas for asylum from her “abusive” family. Only last week the Gulf state issued a statement defending its decision to pursue the footballer after he fled while awaiting trial, and he was convicted in absentia in 2014 for damaging a police station. But Araibi says his prosecution was motivated by his criticism of Asian Football Confederation president Sheikh Salman bin Ebrahim Al Khalifa, a member of Bahrain’s ruling family. “The guilty verdict against Mr Al Araibi remains in place…. (Bahrain) reaffirms its right to pursue all necessary legal actions against (Araibi),” the statement said.